ASTANA – Parliamentarians and experts from almost two dozen countries participated in a Nov. 28 conference in Astana reviewing Kazakhstan’s accomplishments over 25 years of independence and looking into its future. He added that Nazarbayev’s radical reforms in all spheres contributed to the development of market relations and Kazakhstan’s integration into the global economic system, the establishment of a new tax system and modern banking infrastructure, the formation of domestic business, and new economic possibilities in the countryside. He also talked about the formation of the country’s legal system and the measures that helped Kazakhstan become one of the most dynamically developing countries. “Convincing evidence of the high international authority of Kazakhstan and its leader Nursultan Nazarbayev is the election of our state as a non-permanent member of the UN Security Council in 2017-2018. Central Asia will be represented in the Security Council for the first time in its history, and our membership is a chance to attract the attention of the Security Council to regional security issues. Our main idea is to transform the Central Asian region into a zone of peace, cooperation and security. We hope that our regional experience and the experience of [chairing] major international organisations… will be useful for solving the vital issues of peace and security on the agenda of the UN Security Council,” stated Nigmatulin. In his turn, Kazakh Foreign Minister Erlan Idrissov talked about the challenges of creating foreign policy from scratch in 1991. “Despite our size as one of the world’s largest countries, few could find us on a map. Those who did know where Kazakhstan was saw a country which was remote, landlocked, underdeveloped, multi-ethnic, burdened with environmental problems – and surrounded by powerful neighbours. Many feared that those formidable challenges we had to deal with threatened our very survival as a sovereign nation,” he said. “The clear vision of Kazakhstan’s founding President, Nursultan Nazarbayev, of making our country an economically competitive and democratically mature nation urged the Kazakh foreign policy to develop according to two main pillars. First, adopting a balanced foreign policy model based on openness towards the outside world and promoting equal, respectful and mutually beneficial relations with all our partners, near and far. Secondly, assuming the role of a responsible and trusted citizen of the world committed to contributing to global security and progress,” he added. 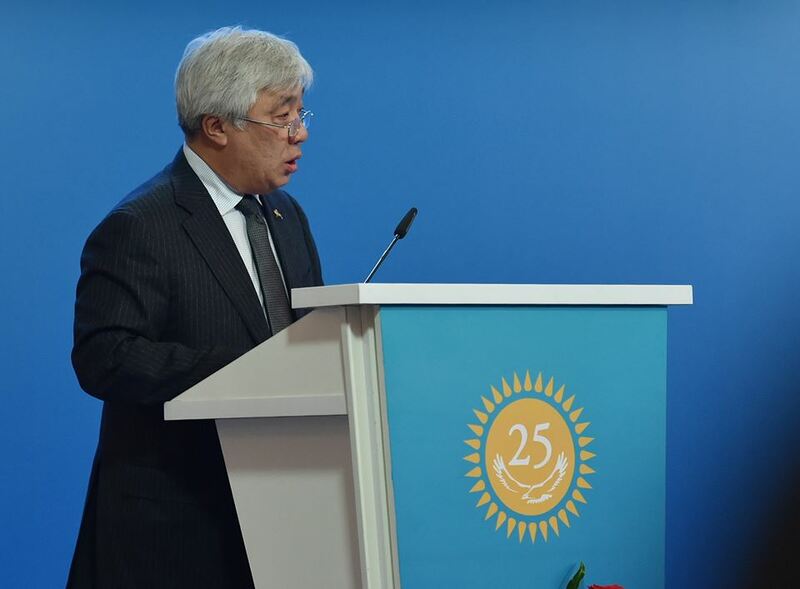 Those pillars have positioned Kazakhstan as a visible international player, said Idrissov. “After 25 years of independence, Kazakhstan has truly secured the role of a genuine geographic, economic and political bridge between East and West and we do our best today to function as such,” he added. Another big step at the dawn of Kazakhstan’s independence was the decision to shut down the Semipalatinsk nuclear test site and become an active leader in nuclear disarmament worldwide. “Together with our neighbours, we established the Central Asian Nuclear Weapons Free Zone, an initiative that has won the backing of all the major nuclear powers. We further believe that regional nuclear-weapon-free zones … must be established and expanded. The establishment of such zones, particularly in the Middle East, would be a major step towards reducing tensions and distrust globally,” said Idrissov. He also added that in 2012, Nazarbayev launched the ATOM (Abolish Testing. Our Mission) Project, an international education and civic activism campaign against nuclear weapons testing. “Currently approximately 300,000 people from about 120 countries have supported The ATOM Project’s online petition calling on global leaders to ensure the early entry into force of the Comprehensive Nuclear-Test-Ban Treaty,” he stated. Idrissov listed major events such as Kazakhstan’s participation in the Joint Comprehensive Plan of Action following the reaching of the deal between P5+1 countries and Iran, the establishment of the world’s first Low-Enriched Uranium Bank and the initiative that led to the adoption of the Universal Declaration on the Achievement of a Nuclear-Weapons-Free World by the United Nations. “All of these achievements came true because of Kazakhstan’s internationally recognised moral responsibility and right to champion the cause of peace and nuclear disarmament. And I am proud that our country stands for these goals around the world. Indeed, nowhere is our commitment to global security clearer than in the field of nuclear disarmament and non-proliferation,” he stated. According to EU Special Representative for Central Asia Peter Burian, Kazakhstan has earned a solid international reputation as an important contributor to peace and stability regionally and globally. “The European Union has since the very beginning welcomed and supported Kazakhstan as a sovereign and independent nation,” Burian said. “EU wants to continue to be a reliable partner for Kazakhstan in its process of transformation and modernisation, sharing our experience and advanced technologies. We hope that Astana EXPO 2017 will provide another opportunity for establishing new partnerships between our companies and research institutions and their Kazakh counterparts for moving our relationship to a qualitatively new, higher level and contributing to increased competitiveness and diversification of the Kazakh economy,” he added. “Kazakhstan’s achievements are very high. Today it is one of the world’s economic development leaders with an active political position. The fact that we have a strong economic potential, especially the potential of our community, especially Russia and Kazakhstan … is to the merit of the presidents of our states, our Parliaments, which consistently create all conditions for policy directions to be implemented,” said Vladimir Vasiliev, deputy chairman of the Russian Duma. 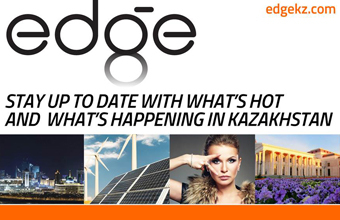 Kazakhstan’s economic achievements were also highly praised at the conference. According to Xu Jian, deputy president of the China Institute of International Studies under the country’s Ministry of Foreign Affairs, Kazakhstan has become an island of stability in Central Asia for its long term political stability and harmony between the ethnic groups and religions. The country has also seen sustained economic development, with gross domestic product increasing by 23 times and GDP growth staying at more than 8 percent for 10 years in a row. “People’s living standards improved significantly and the GDP per capital reached $14,000,” he said. “Under the leadership of President Nursultan Nazarbayev, Kazakhstan abolished the planned economy, steadily promoted the reform of marketisation and privatisation and walked out of the economic downturn,” he added.